Diabetes is at record high levels in the U.S. The EVMS Strelitz Diabetes Center helps individuals battle the disease and lower their risk of developing complications. Minority populations have a greater risk of developing type 2 diabetes and diabetes-related complications than non-Hispanic whites. Southeastern Virginia has some of Virginia’s highest incidences of diabetes and Western Tidewater leads Virginia in diabetes-related deaths. Studies have shown that diet, exercise and behavior modification can reduce your risk of developing type 2 diabetes by 58%. 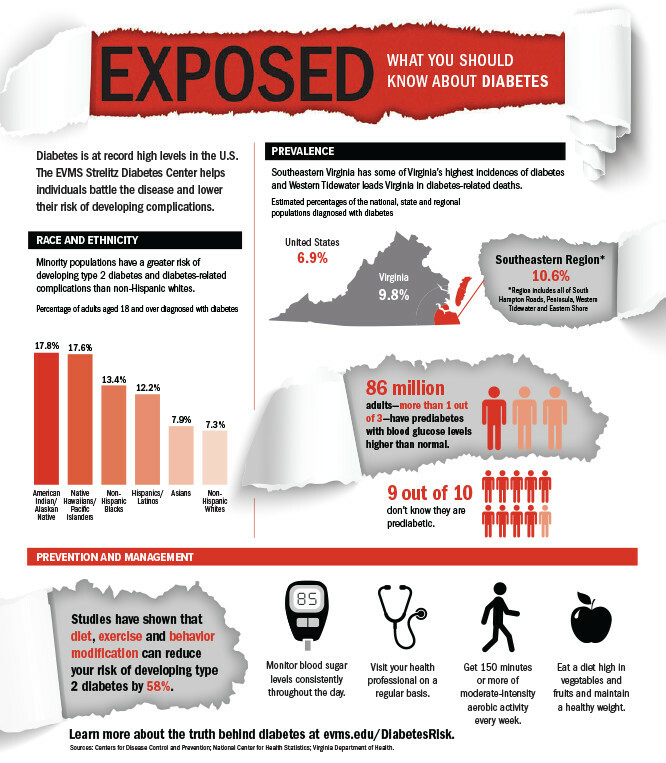 Learn more about the truth behind diabetes at evms.edu/DiabetesRisk. Enjoy your website. Keep up the good work.